The pilgrim routes from the Swedish eastcoast - about 550 km - go to the Swedish Norwegian border, crossing the high mountains and finally arrive in Nidaros, the medieval name of Trondheim, city of Saint Olav. The approximate direction of the the routes you can see on the (still rather primitive!) map. On that page you will also find photogalleries, "fotoalbum", from the routes. 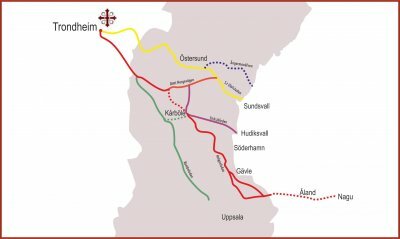 The routes presented on the map are (from south to north) Romboleden, Helgonleden, Stråsjöleden (these routes are all connecting with JämtNorgevägen to Trondheim. Pilgrimsleden Sankt Olof passes Stiklestad before ending in Trondheim. The Swedish word "Leden" means path or route. Saint Olav (or Olof as we call him in Sweden) was a Viking king who turned christian and was baptized in Rouen, France, around 1013 AD. Killed in battle in Stiklestad, north of Trondheim, he was soon considered a saint and pilgrims started to come to his shrine. He was the saint both for farmers, sailors and fishermen, and you will find his picture in almost all medieval churches along the routes. After the Lutheran reformation all pilgrimage was forbidden, but today pilgrims are walking the ancient routes again. Guided tours and packages with almost everything included: Where to get more information! On the page for "Kontakter"/Contacts you can send an email to anyone of us and we will help you as much as we can with advice and information about our routes! How to get here: You can take a flight to Stockholm/Arlanda and then a train to either Hudiksvall or Sundsvall, depending on which of our routes you plan to walk along. The trains run frequently and it will only take about 2-3 hours to get here. You may have breakfast at home almost anywhere in Europe and dinner here!